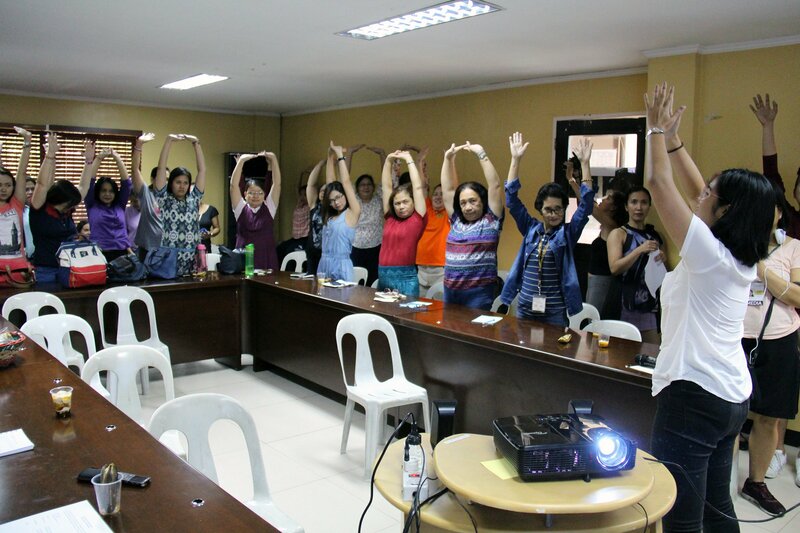 Participants and resource speakers alike follow along with a physical therapist from the University Health Service as she demonstrates some simple exercises office workers can do at their work stations. Photo by Jun Madrid, UP MPRO. 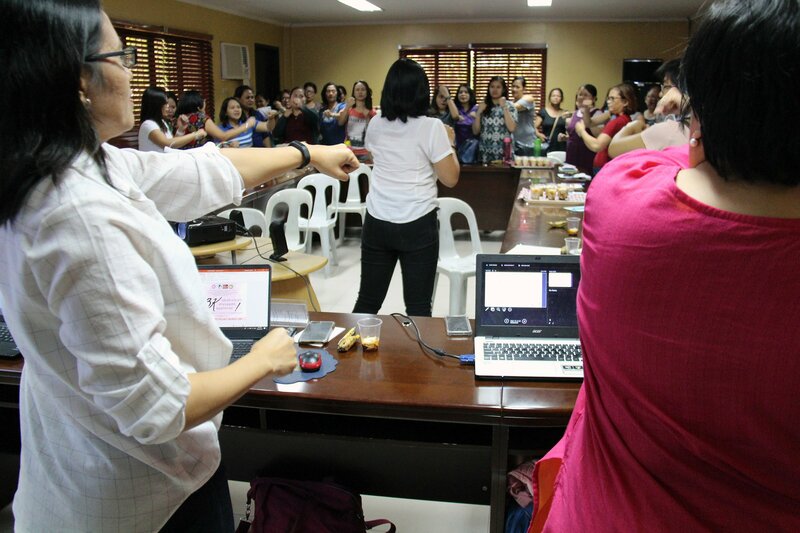 Women’s health and wellness was the focus of an afternoon of lectures dubbed “3K: Kababaihan, Kalusugan, Kaunlaran! 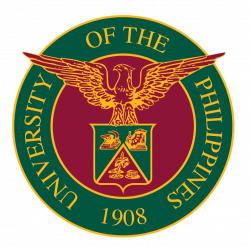 Women’s Health as a Priority Agenda,” organized by the UP Center for Women’s and Gender Studies (UPCWGS) in collaboration with the UP College of Social Work and Community Development’s Doctor of Social Development Program (UPCSWCD-DSD) and the UP Diliman University Health Services. 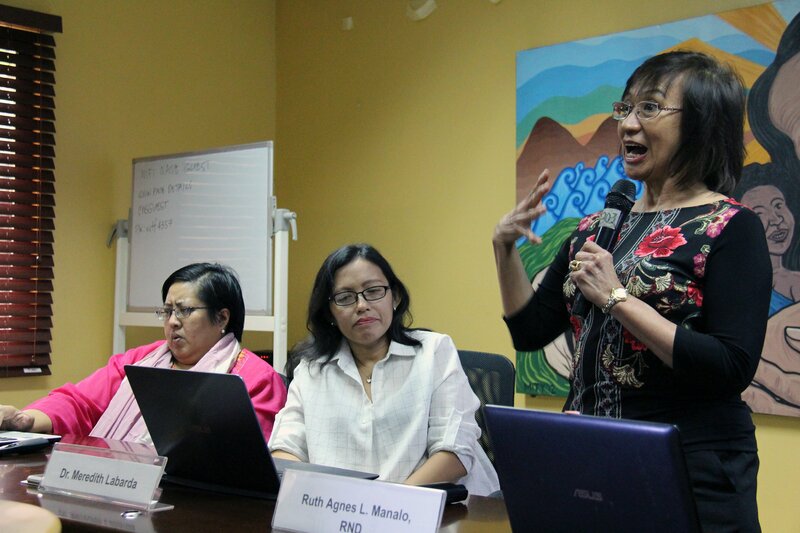 The lectures were held on March 28 at the UPCWGS Conference Room. Addressing a crowded room of University women were three speakers: Ms. Ruth Agnes L. Manalo, a resident nutritionist and dietitian of the University Health Service; Dr. Ferdiliza Dandah Garcia of the UP Manila College of Allied Medical Professions; and, Dr. Meredith del Pilar-Labarda of the UP Manila School of Health Sciences. UHS resident dietician and nutritionist Ruth Manalo (standing, right) enumerates the rules of healthy eating, especially for women. Photo by Jun Madrid, UP MPRO. Ms. Manalo presented a list of good eating habits for women in order to maintain a long, healthy life, including: eating a wide, balanced variety of foods; steering clear of fad diets; and, eating generous portions of fruits, vegetables and high-fiber foods, as well as appropriate amounts of food rich in protein, carbohydrate and calcium every day. UPM-CAMP’s Dr. Ferdiliza Dandah Garcia describes the common aches and pains women are prone to at work, and how physical activity and exercise can counteract these. Photo by Jun Madrid, UP MPRO. Dr. Garcia, on her part, discussed common health problems women face at work, such as back pains, headaches and other ailments. She stressed the importance of getting enough physical activity, such as ten minutes of movement every two hours for office workers who spend most of the time sitting down. A physical therapist from the UHS assisted by demonstrating some simple exercises any office worker can do to prevent body aches. The audience giving the exercises for office-workers a try. To try these exercises yourself, check this link or simply do an Internet search. Photo by Jun Madrid, UP MPRO. 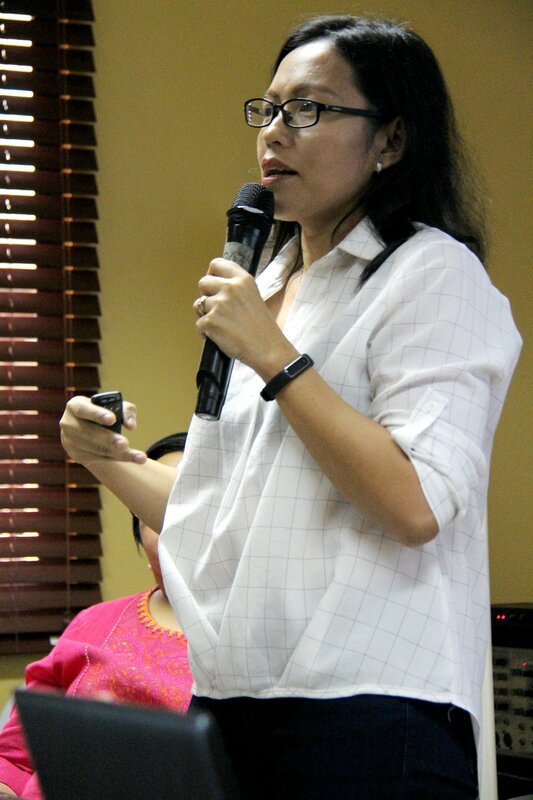 Finally, Dr. Labarda gave an overview of the health problems that women risk having. Of these, non-communicable diseases such as heart disease, stroke, cancer, diabetes and osteoporosis make up the leading causes of death and disability among women, especially aging Filipino women. As did the previous speakers, she stressed the importance of self-care and lifestyle medicine for women, consisting of: healthy eating habits; engaging in adequate physical activity and exercise (at least 30 minutes of moderately intense exercise three times a week); getting enough sleep (at least seven to nine hours of sleep for adults); cultivating meaningful relationships; and, connecting to one’s sense of spirituality. UPM-SHS’ Dr. Meredith del Pilar-Labarda synthesizing the main points of the previous speakers and reminding the audience of the importance of self-care and lifestyle medicine. Photo by Jun Madrid, U PMPRO. 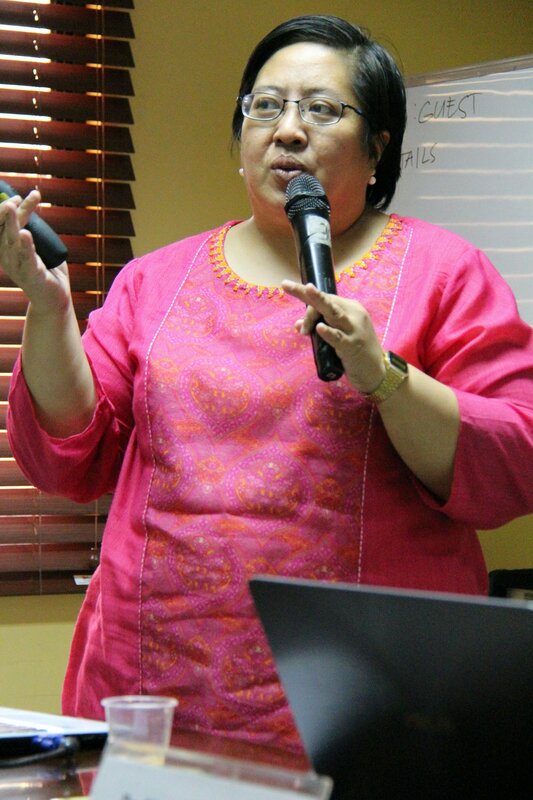 Prof. Excelsa Tongson, the UPCWGS deputy director of the Training, Outreach and Extension Program and UPCSWCD-DSD Director Ma. Theresa V. Tungpalan delivered the welcome address and special messages, respectively, while Dr. Maria Daniella R. Bantilles, head of the Public Health Unit of the UHS, gave the closing remarks. 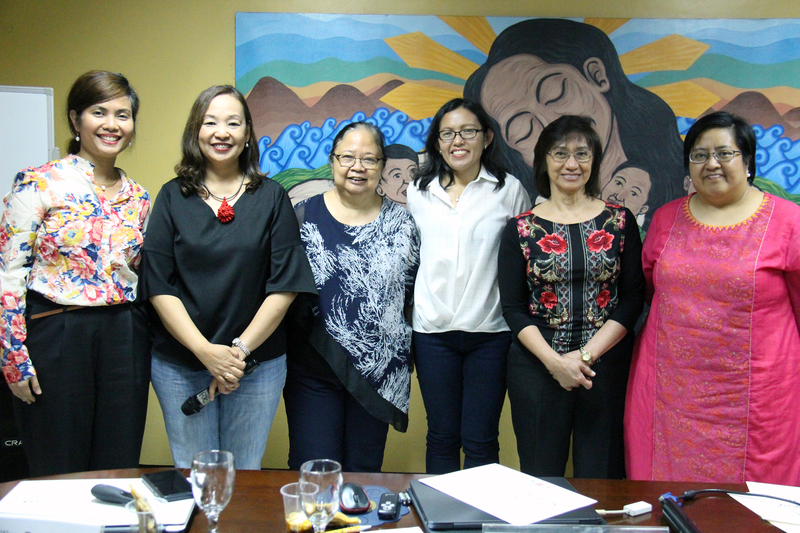 From left to right: UHS Public Health Unit head Dr. Maria Daniella R. Bantilles, UPCWGS deputy director of the Training, Outreach and Extension Program Excelsa Tongson, UPCSWCD-DSD Director Ma. Theresa V. Tungpalan, Dr. Labarda, Ms. Manalo and Dr. Garcia. Photo by Jun Madrid, UP MPRO.